More Game, More Guns, More Power! 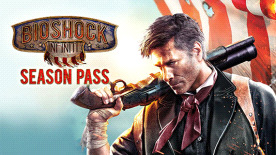 Extend the narrative and adventure with the BioShock Infinite Season Pass. Get three DLC packs at an incredible discount, plus an exclusive Early Bird Special bonus pack, only available to Season Pass holders. Come back to Rapture in a story that finds Booker and Elizabeth on the eve of the underwater city's fall from grace. Developed by Irrational Games, the developer of the original BioShock and BioShock Infinite, this DLC features Rapture as you’ve never seen it before—a shining jewel at the bottom of the ocean, built almost entirely from scratch in the BioShock Infinite engine. Gameplay has been modified to give the player an original BioShock combat experience that merges the best parts of BioShock and BioShock Infinite: new weapons, new Plasmids/Vigors, Tears, Sky-Lines, and Big Daddies. In this DLC pack, you become Elizabeth as she seeks to bring closure to her story, and to BioShock Infinite’s. Like Episode 1, this DLC features Rapture as you’ve never seen it before and gameplay has been modified to give the player an original BioShock combat experience that merges the best parts of BioShock and BioShock Infinite. All Season Pass content will be available for individual purchase by March 2014. The instant bonus can only be obtained by purchasing a Season Pass. Please note: Add-On Content, BioShock® Infinite required to play.